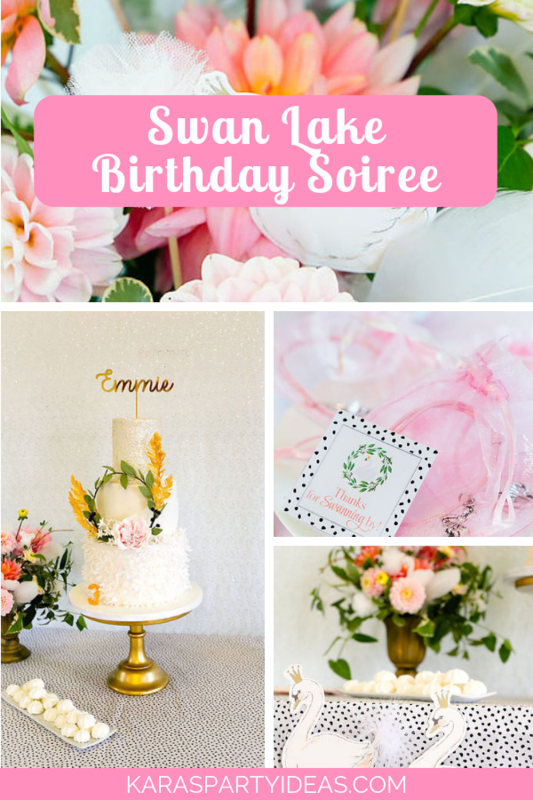 Pinch me and make me swoon, this Swan Lake Birthday Soiree by Kelly Harmer of Oh So Kel, out of Portishead UK, is too cute! 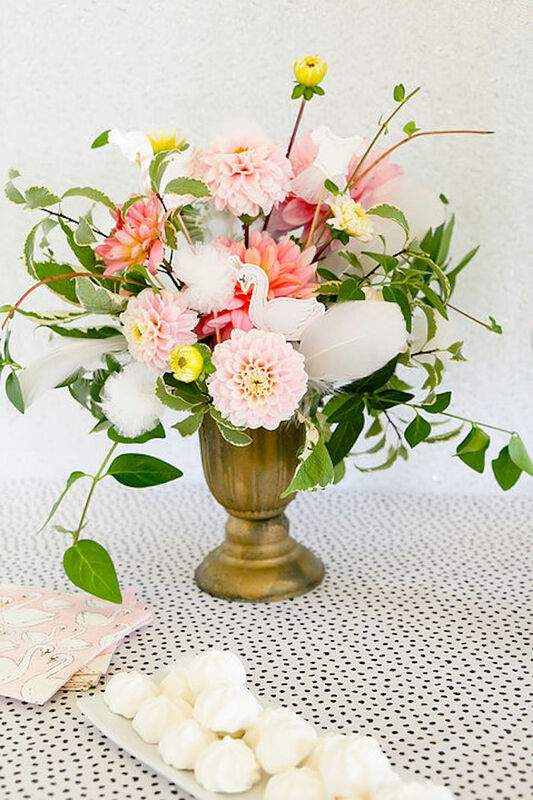 Filled with soft details and a touch of glam, this celebration is certain to add to your party plan! 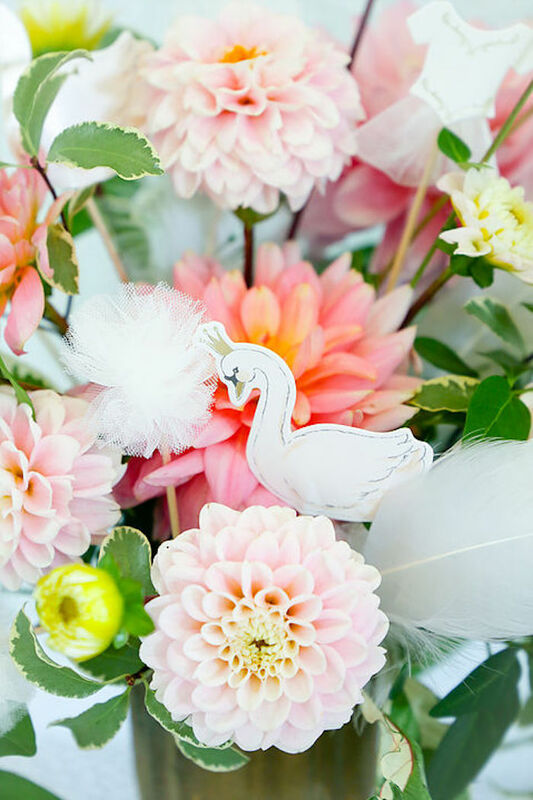 And other sensational Swan-inspired Greenery + Blooms! 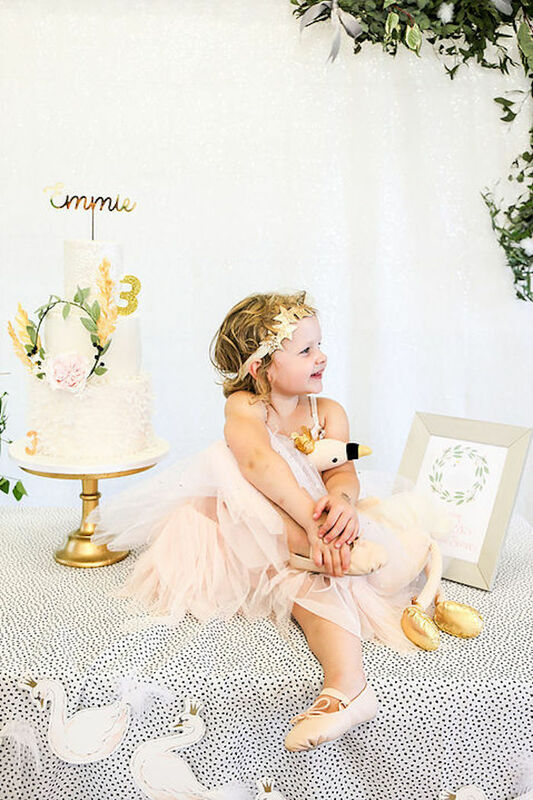 “Most little girls dream of being a ballerina or princess at some stage don’t they? And if my two girls are anything to go by dressing up is pretty high on their list of favourite activities too. 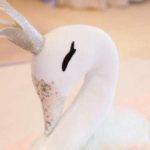 Our daughter wanted a ballet party for her third birthday party so we created a Swan Lake Soiree fit for any budding ballerina, complete with dancer dress up area and DIY details. 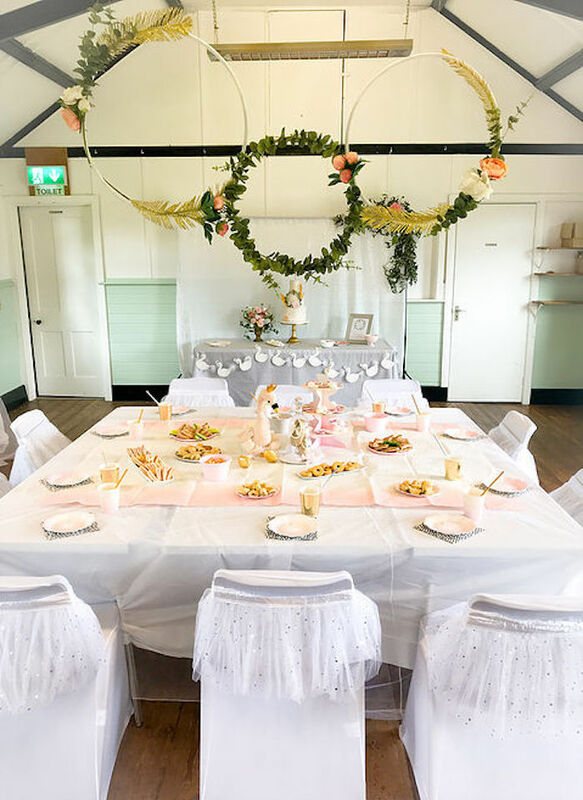 Normally I’d share the decor details first, but as this party was so centred around dressing up I thought I’d mix things up a little! 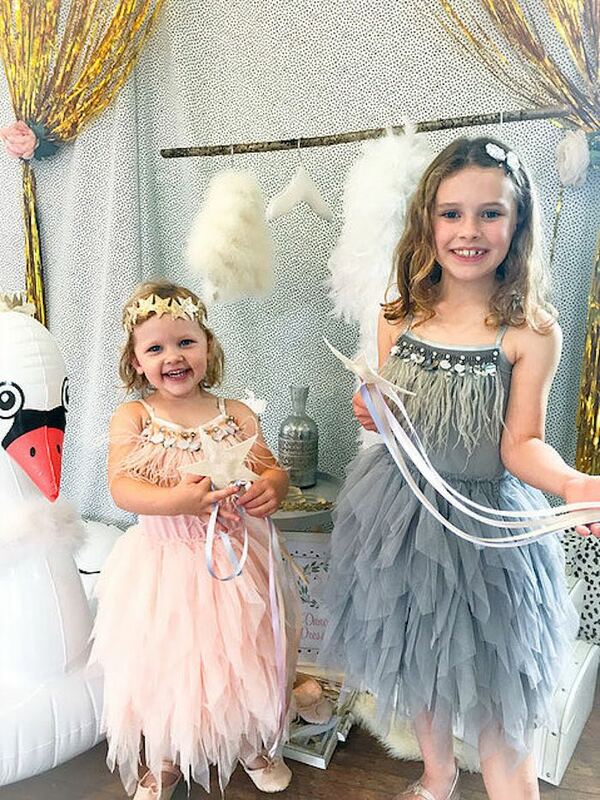 We fell in love with these peach and grey tutu dress for our two girls. 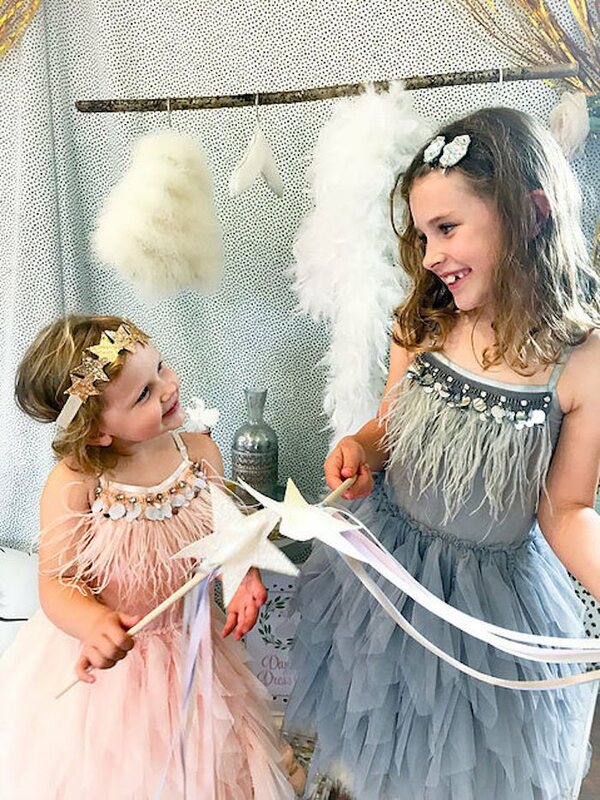 The layers of tulle, flouncy feathers and sparkly jewels in one dress is a little girl’s dream hey?! The sparkly gold headband worked perfectly with the blush dress and the jewelled hairclips looked beautiful against the grey of the other one. 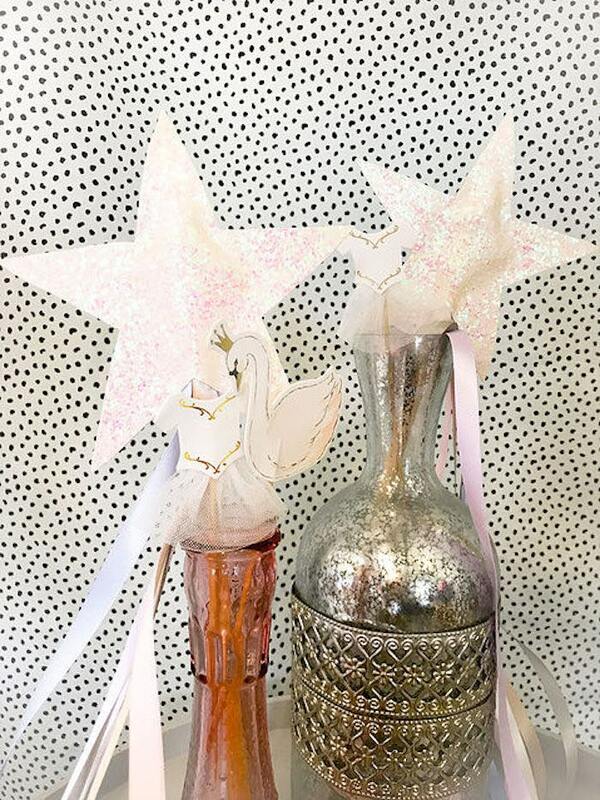 Teamed with sparkly wands they had the perfect accessories for any swan lake princess. 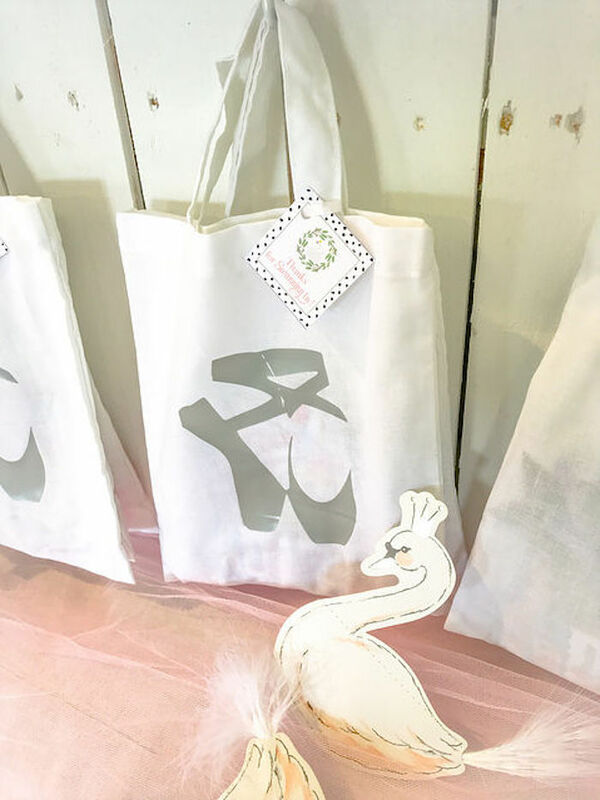 I’m a huge fan of Dalmatian dots as the party decor shows, so my custom made ‘Mama’ t-shirt was the perfect match. 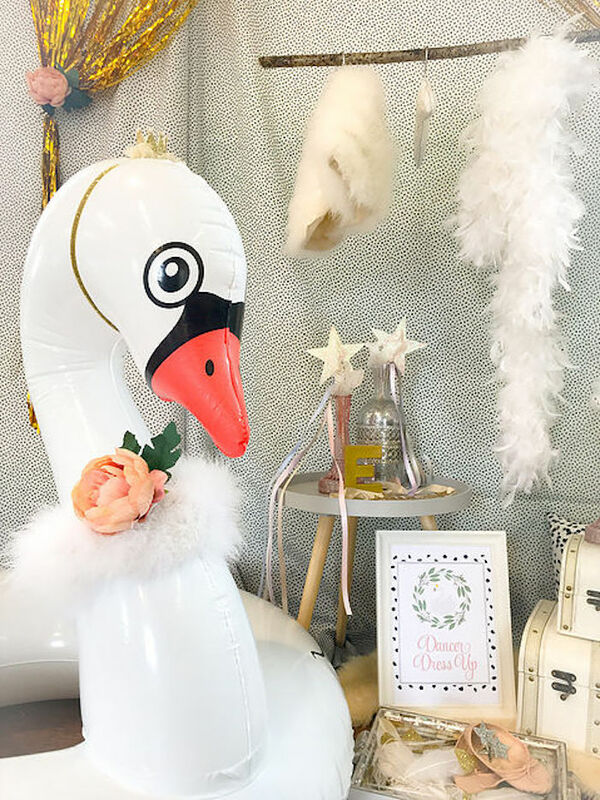 No Swan Lake Soiree would be complete without a dancer dress up area and an inflatable swan wearing a sparkly crown right?! 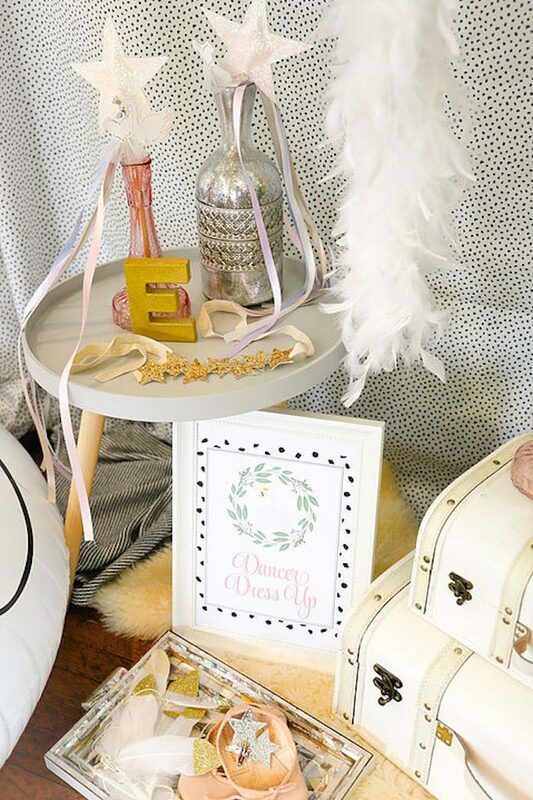 Using dainty dalmatian dot fabric as the backdrop, we then suspended a branch from the ceiling using fishing wire for feather capes and boas and had props for dancers to choose including sparkly wands and sparkly star hair clips. 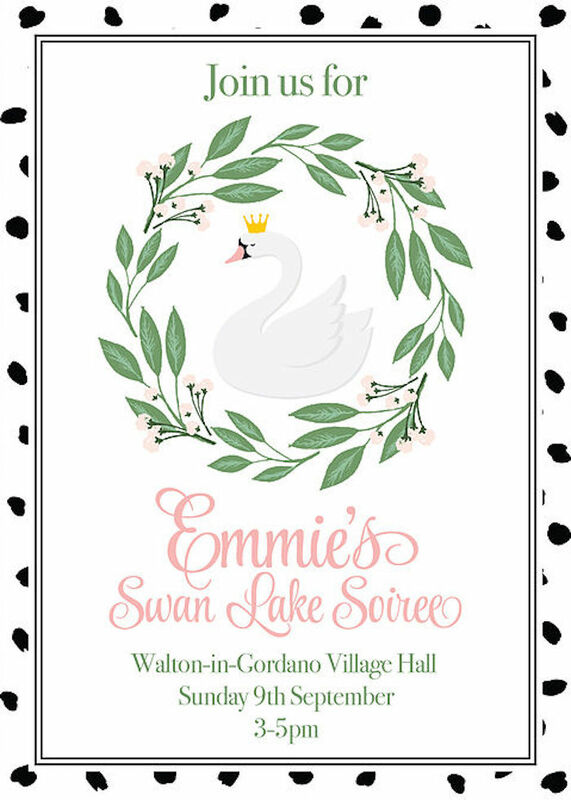 The girls loved sitting in the swan to have their photographs taken and it really brought a fun element to the party. 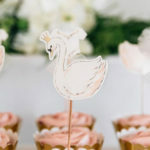 The cake toppers looked adorable perched in the flowers and the incredible swan garlands worked beautifully across the front of the table. The swans almost looked like they were swimming across it! 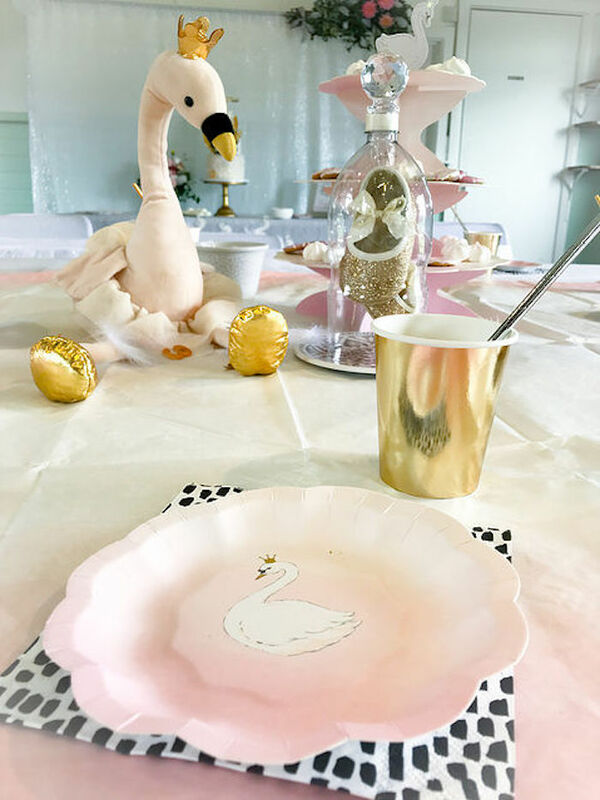 The swan topped cake stand came in really handy for the food and the pink ombre tablecloth, plates, cups and adorable swan serviettes added the final touches. 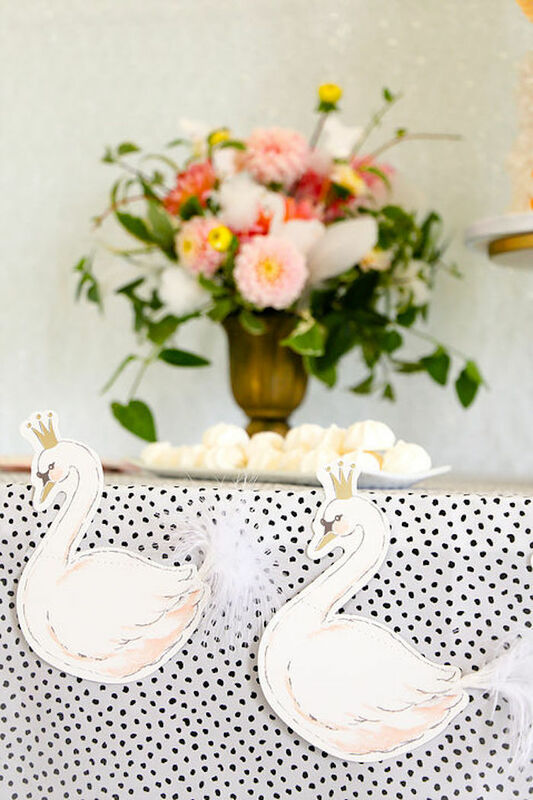 Doesn’t the swan princess toy look adorable on the table?! Our daughter had it for her birthday and it’s a wonder she allowed it to be placed on the table for the first half of her party! 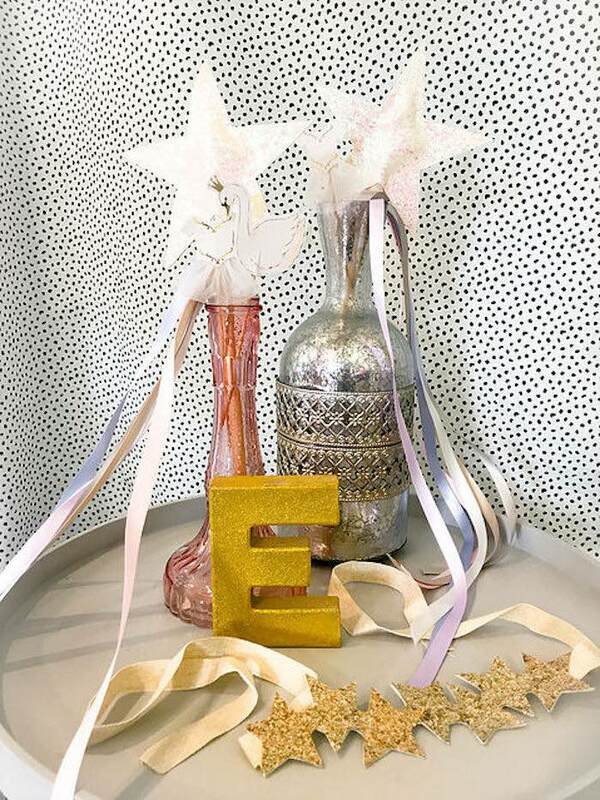 We set up a photo backdrop stand and used safety pins to hang the 6x8ft white sequin tablecloth. 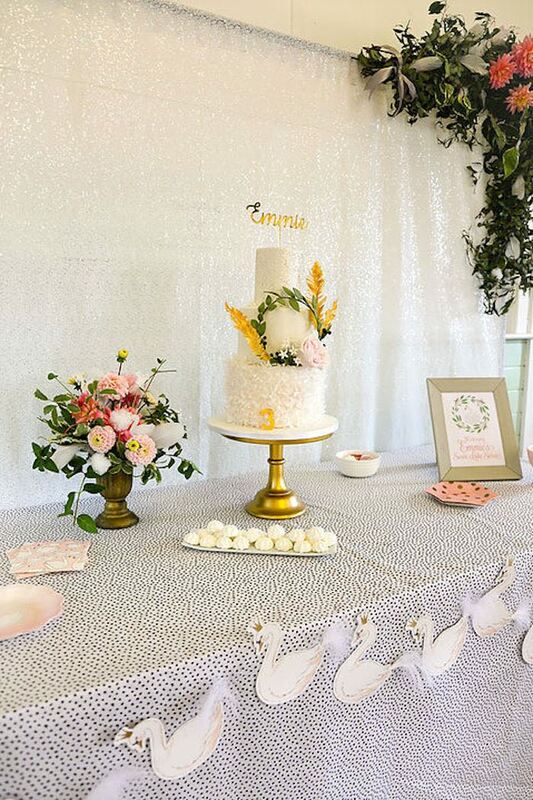 For the tablecloth on the cake table we used pinking shears to cut a piece of the 10m of dalmatian dot fabric. The chair covers have come in so handy and help to neutralise any space. They looked completely wonderful adorned with sparkly star tutus and even better that all guests got to take a tutu home! 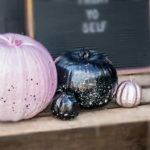 All Oh So Kel parties tend to feature DIYs and this one was no exception. 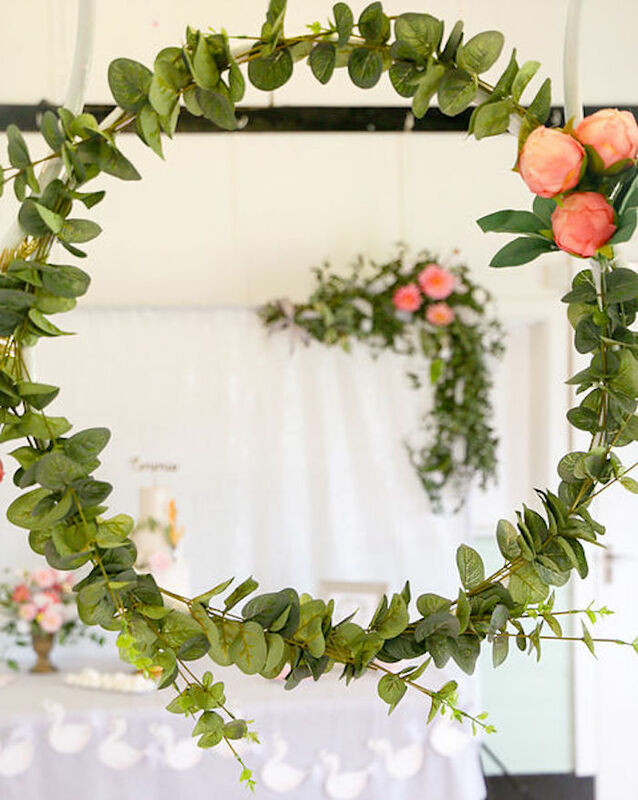 Pinterest got me obsessed with floral hoops so I decided to make some to suspend from the ceiling and I’m so pleased with how they brought the whole scheme together. 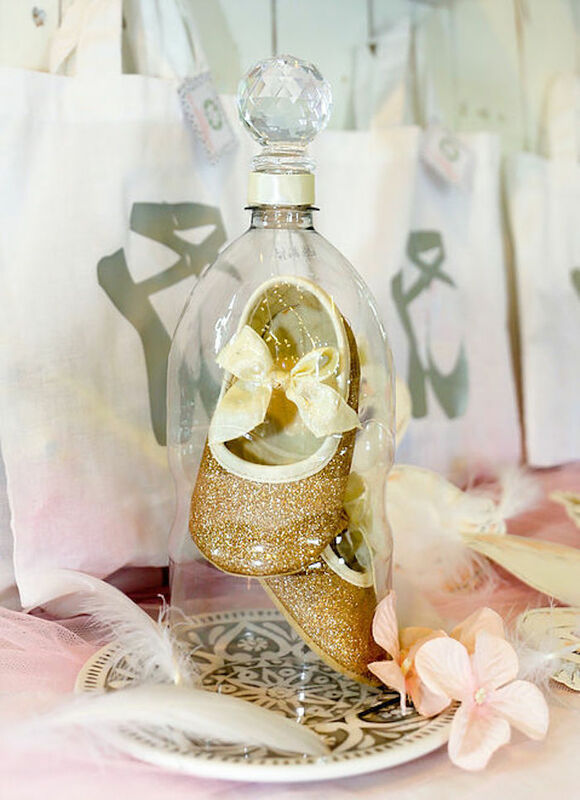 Our daughter’s first ever party shoes hung inside the cloche was a last minute DIY which I made on the morning of the party using a plastic 2l coke bottle. It was much more child friendly than a glass one and teamed with a plastic bottle stopper we already had, cost absolutely nothing. The best kind of decoration! 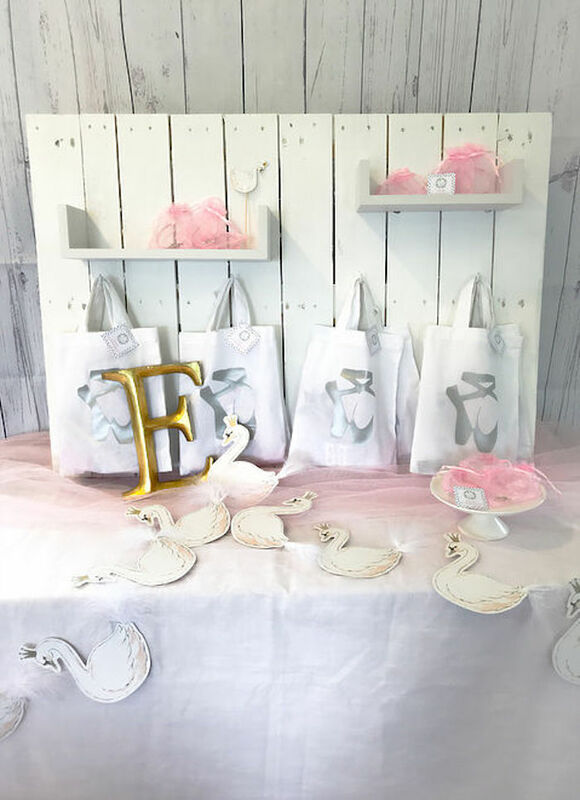 I made a display board to hold the party bags and favours using my favourite party item – wooden pallets. It looked really effective and cost next to nothing. 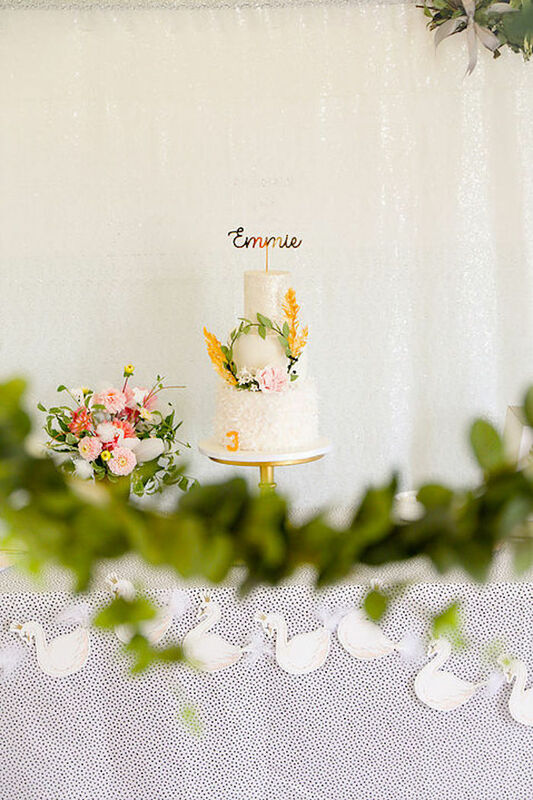 Angel’s Kitchen created a truly angelic cake that certainly had the wow factor, complete with fine feathery flowers on the base to mimic ballerina tutus, shimmery top to match the backdrop and knockout hoop with gold feathers and pink flower to match the DIY hoops. 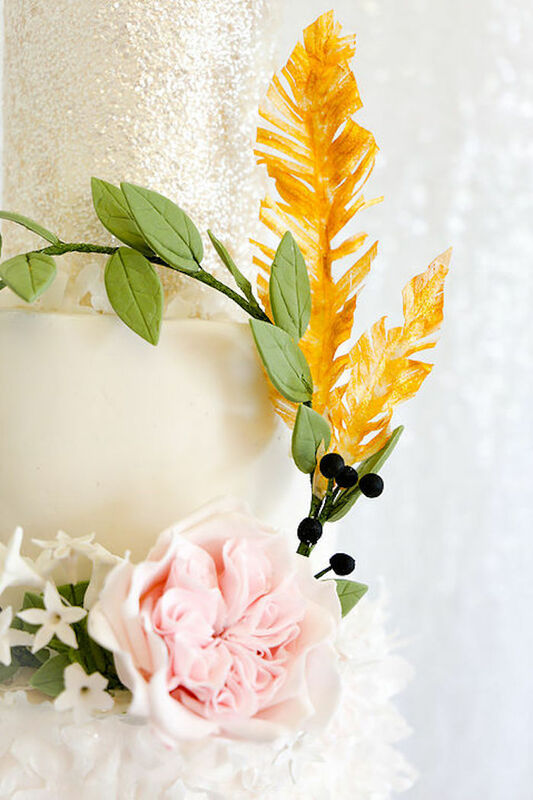 The little black berries were the perfect detail to pick up the black dalmatian dot fabric too and the cake topper really was the icing on the cake so to speak! 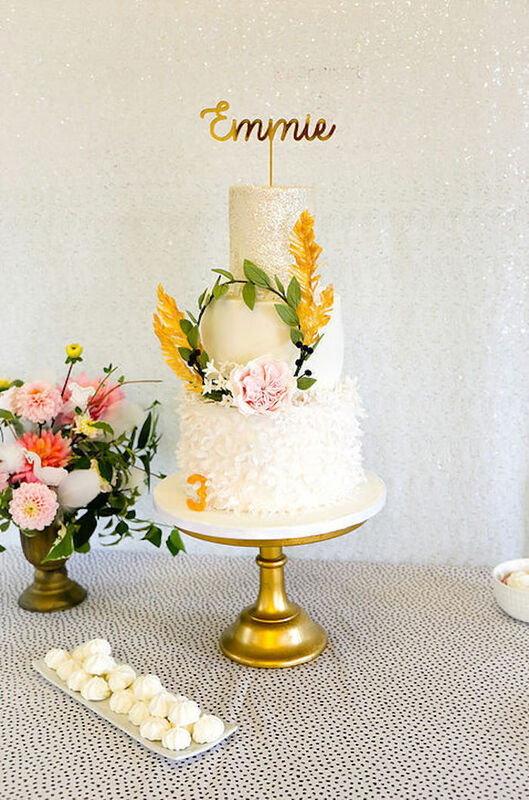 I love the gold against the sparkly white cake and backdrop. 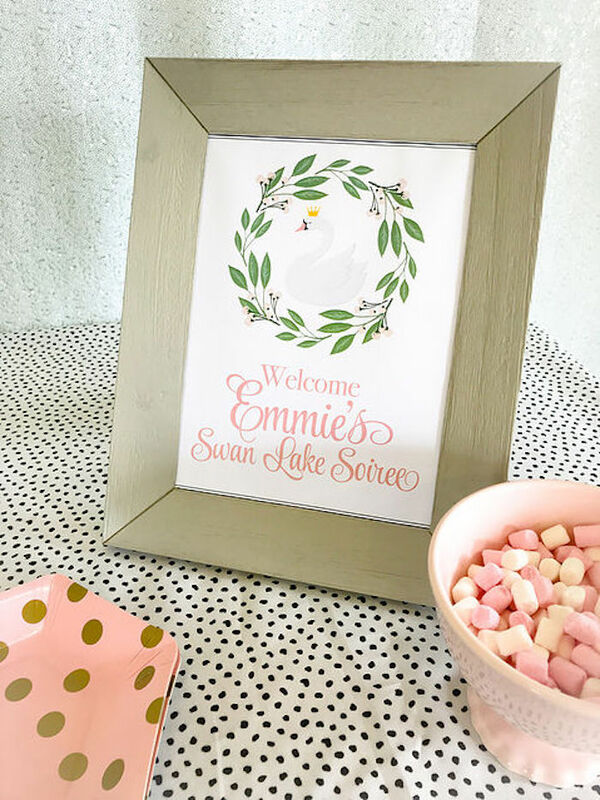 The invites and printables really pulled together the main theme elements and the ‘thanks for swanning by’ favour tags were such a cute touch! 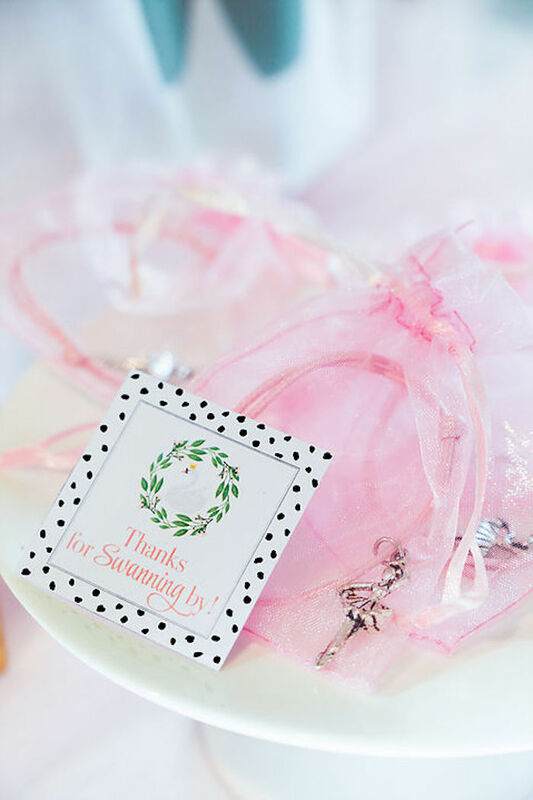 The most adorable cloth ballet shoe bags were full of classic party treats, plus guests took away ballerina charm bracelets in pink organza bags and dreamy white tutus with silver stars (that also acted as chair decorations). 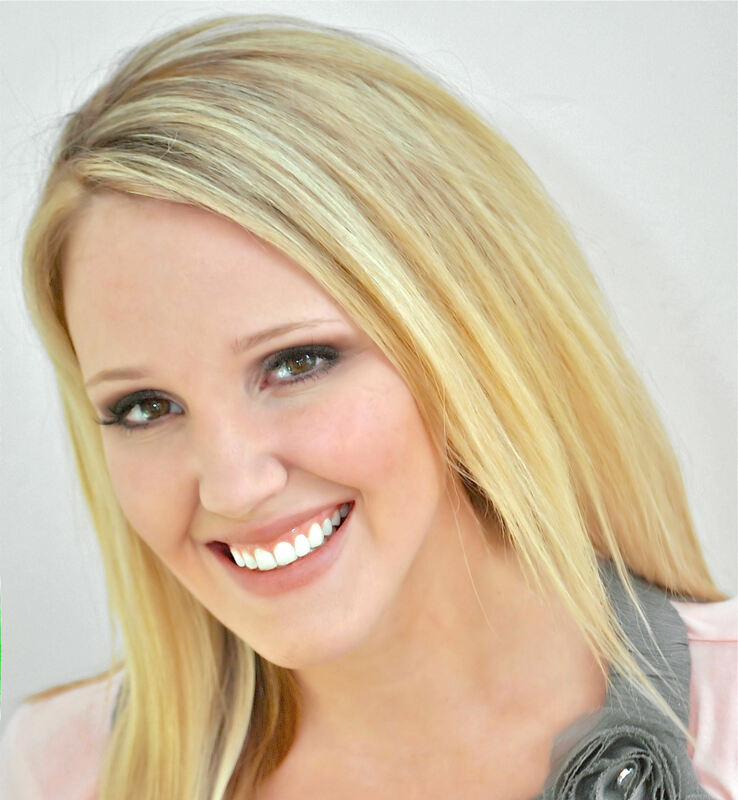 Sparkly star hair clips were given out to complete the swan lake princess looks. 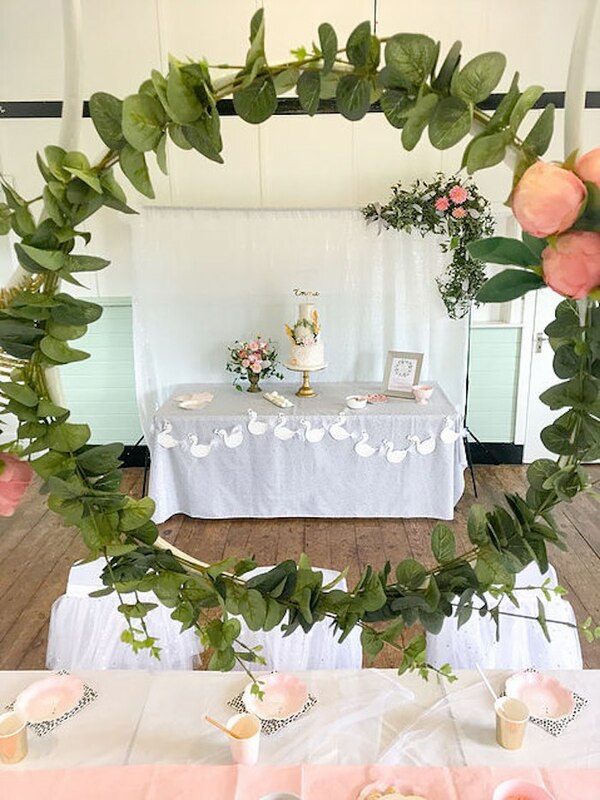 The DIY floral hoops were echoed in the stunning garland that hung over the corner of the table backdrop, complete with whimsical feathers and a pop of pink. 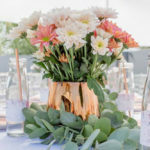 My incredible mum made the table showstopper using the gold urn from our Day of the Dead party (who’d have thought we could share a prop from a halloween party at a swan lake soiree?!) plus foliage and flowers from her own garden. Our daughter adores her ballet teacher so nobody else would do for the entertainment. Our swan lake dancers enjoyed games and a ballet lesson that was suitable for everyone, including parents who got dragged up at the end!